Don’t you just love a good repurposing project? I do and I recently began getting really excited about doing some decorating in my lawn and garden area. I thought that maybe some repurposing would come in handy so I started looking around and I found some wonderful wheelbarrow repurposing ideas. 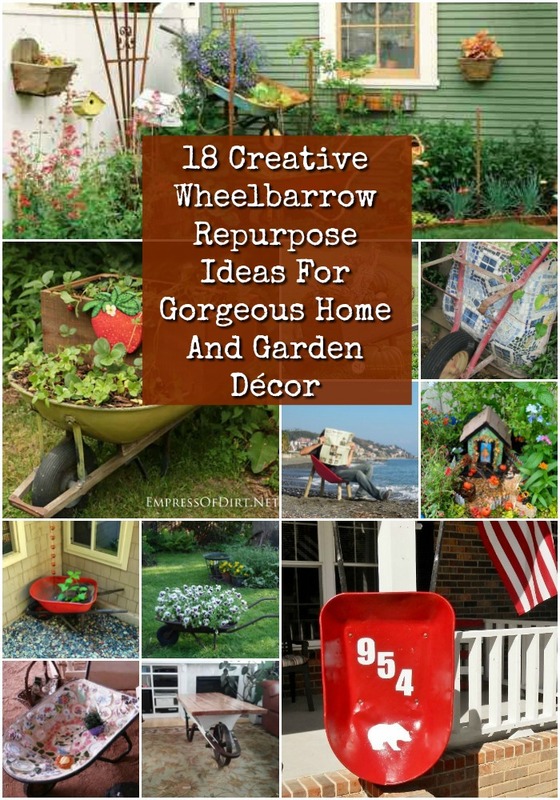 These 18 cool wheelbarrow repurposing ideas will give you gorgeous décor for your home and garden and they are all really easy to do. You can use an old rusted wheelbarrow for many of these or if you have a newer plastic one, that will work, as well. There are some great ideas, like a wheelbarrow address sign, a barbecue grill and even a gorgeous old rusty planter. There are so many ways that you can reuse items, I honestly don’t know why we ever throw anything away! And, if you are in the mood to create some likely farmhouse inspired décor, you have to take a look at these 40 wooden ladder repurpose ideas, too. 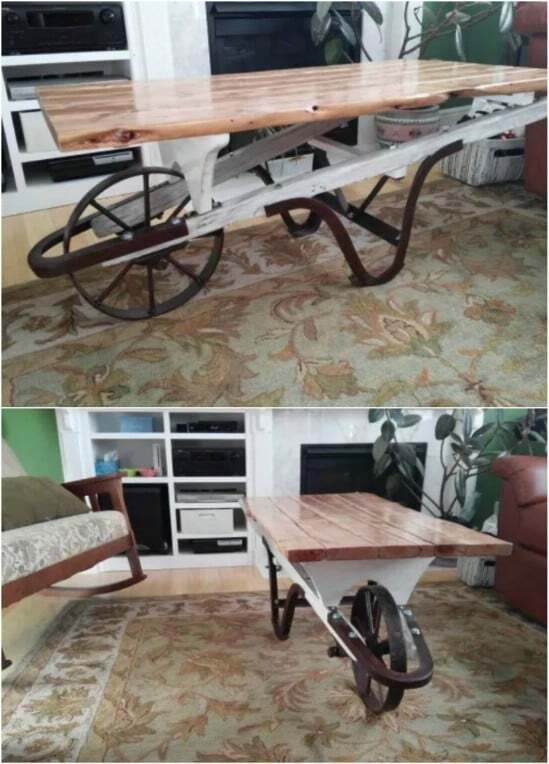 There are projects in here that will perfectly complement your wheelbarrow repurpose projects. If you have old rusted tools and equipment, there really is no need to throw it out. Rust after all, just gives things a nice rustic look, right? And what better way to give your home and garden a rustic look than with an old wheelbarrow? There are so many wonderfully easy ideas in here – I can’t wait for you to take a look. And, be sure that you also look at these 25 rustic repurposing ideas for old garden tools. No matter what you have on hand that you need to repurpose, I promise that there is a way to turn that trash into treasure! You can make this cool address sign from a repurposed wheelbarrow – and you can use a metal or plastic one. You just have to paint in your house numbers. This is a really rustic looking sign and if you have a rusted metal wheelbarrow, that would be even better. This is a quick and simple DIY address sign that will take you less than an hour to make. I love creative ideas for displaying house numbers! 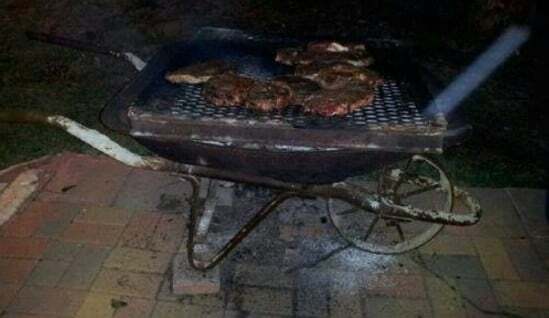 If you have a metal wheelbarrow, you can easily turn it into a portable barbecue grill. You just have to add the grill to the top. The metal will keep wood or charcoal in place and it’s heat resistant so this is a great grill for camping or at home cookouts. 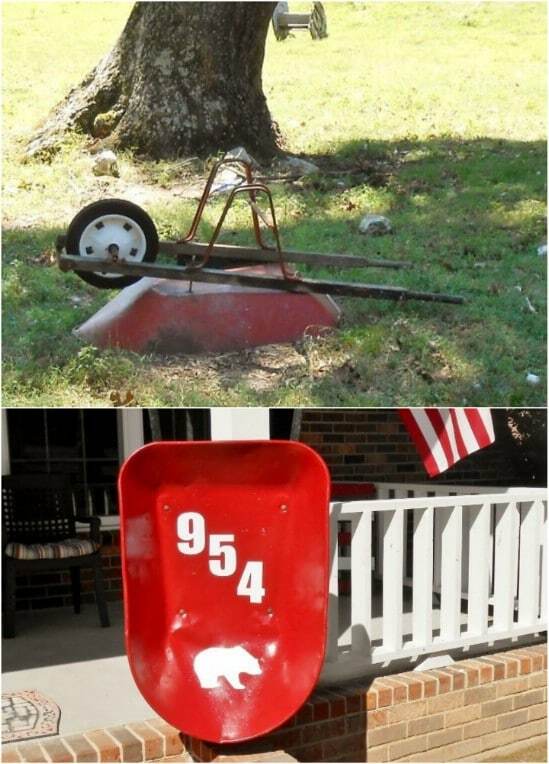 This is such a simple project and it’s a great way to repurpose that old metal wheelbarrow. 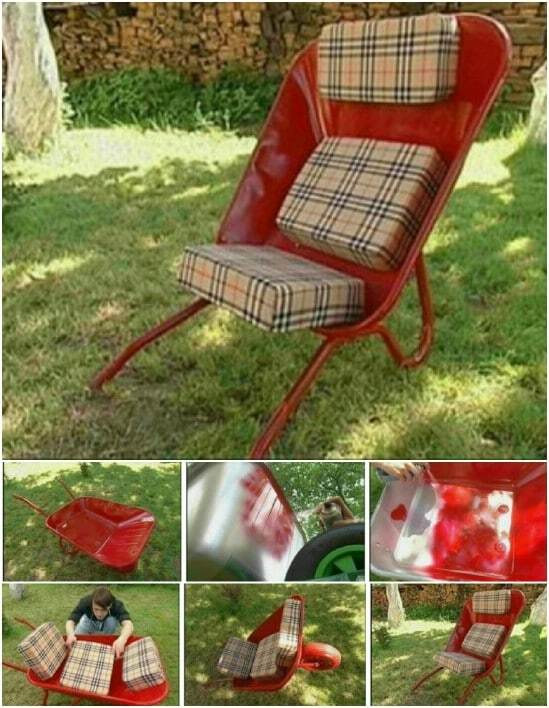 I love this idea for turning a plastic wheelbarrow into a comfy and relaxing chair. 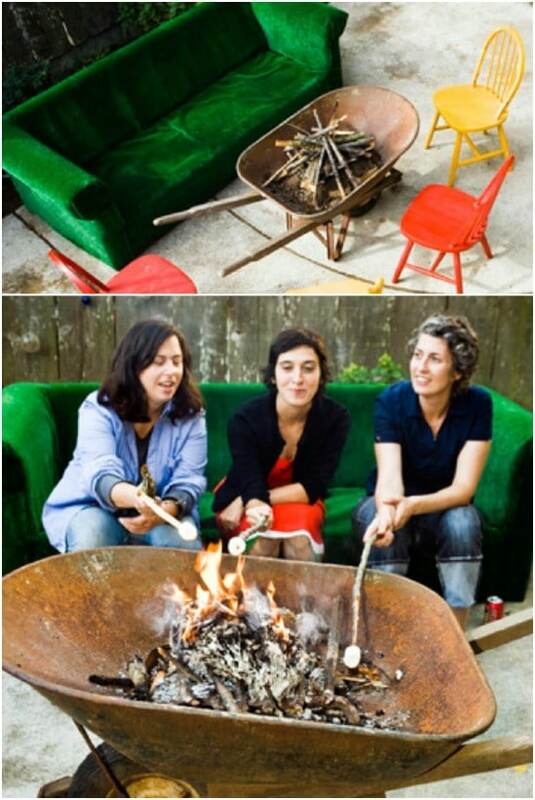 This would be a great way to add some cheap seating around a firepit or anywhere in the yard. If you live near water, these are the perfect relaxing chairs for sitting up near the beach or lake and there is very little work involved. You can have the entire thing made in less than an hour. If you love the rustic farmhouse look, you are going to adore this DIY coffee table that you can make from an old metal wheelbarrow. The base of the table is the wheelbarrow and you just add a wooden top, which can be done with old pallets if you really want a farmhouse look to your furniture. This one is pretty simple to DIY and it is gorgeous when it’s finished. 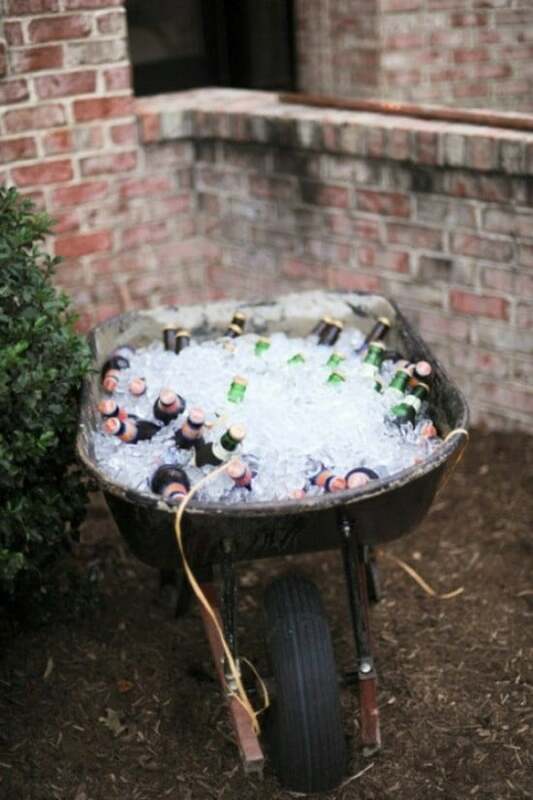 If you are hosting an outdoor party, that old wheelbarrow can be used to make a nice rustic cooler. You may want to check to ensure that there aren’t any paint chips or flakes and that the metal is in good shape. You don’t want someone getting scratched by the old metal. If your wheelbarrow is in pretty good shape, you just add ice and drinks and you have a wonderfully farmhouse inspired cooler for your outdoor entertaining. 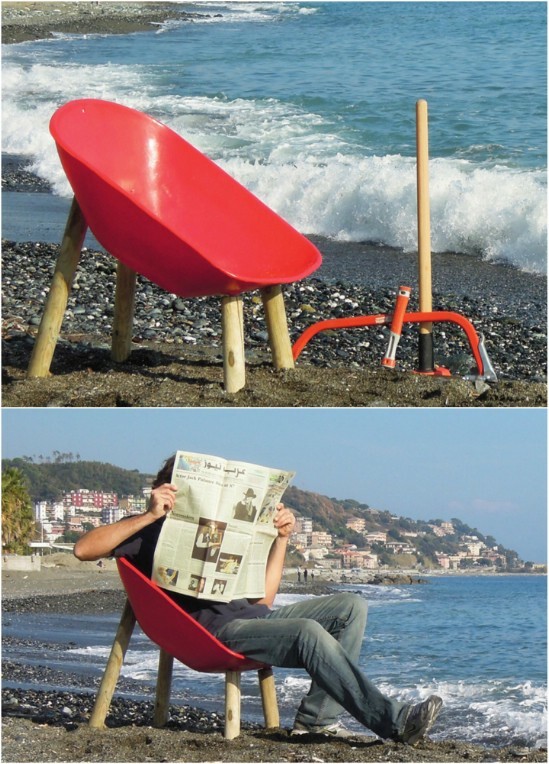 An old wheelbarrow painted to make it look new makes a wonderful chair. You just have to remove the wheels and tip the wheelbarrow on its side. You can add homemade cushions, which are pretty easy to DIY and attach them to the appropriate places in your chair with Velcro to keep them firmly in place. These make adorable patio seating and would look great around your firepit. 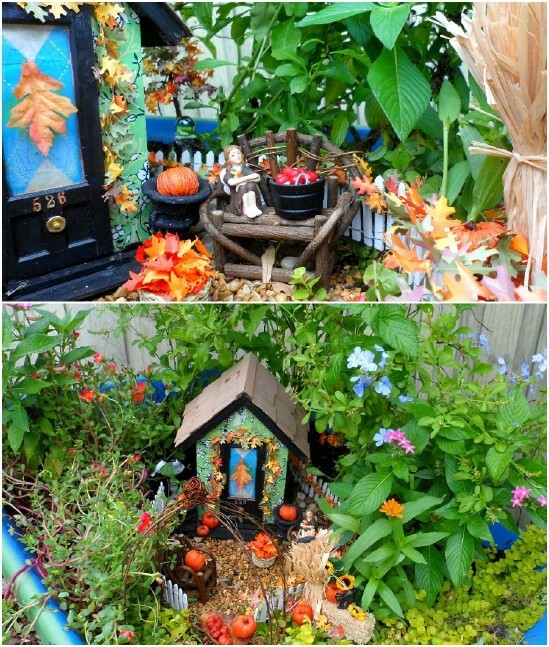 Fairy gardens are so much fun – to make and to admire. 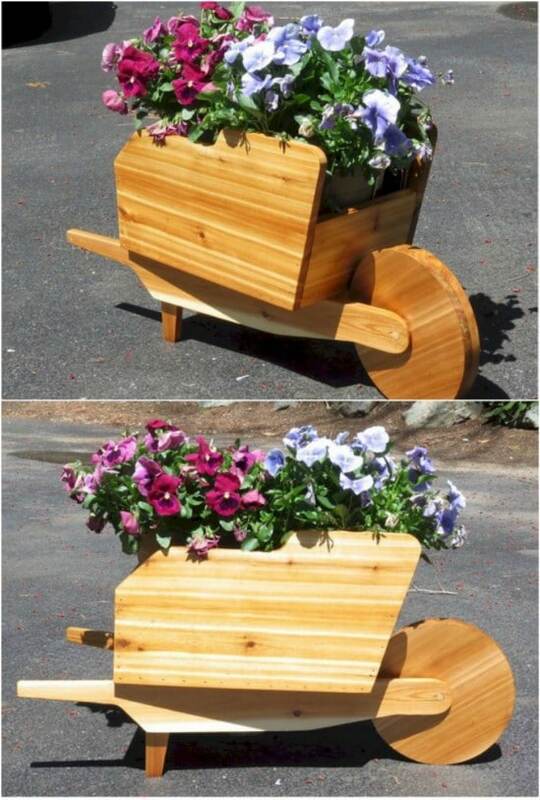 You can make this one in an old wheelbarrow, which is perfect if you need to move it around. A DIY fairy garden is much easier to make than you may think and using an old wheelbarrow as the base is genius. Just add your DIY fairy furniture and you’re all done. When you need to mow around the garden, you can just move the wheelbarrow out of the way until you’re finished. A wooden wheelbarrow is a great choice for creating a seasonal display for the front yard. This would work beautifully for fall mums and flowers and you can just change it out for every season or special occasion. 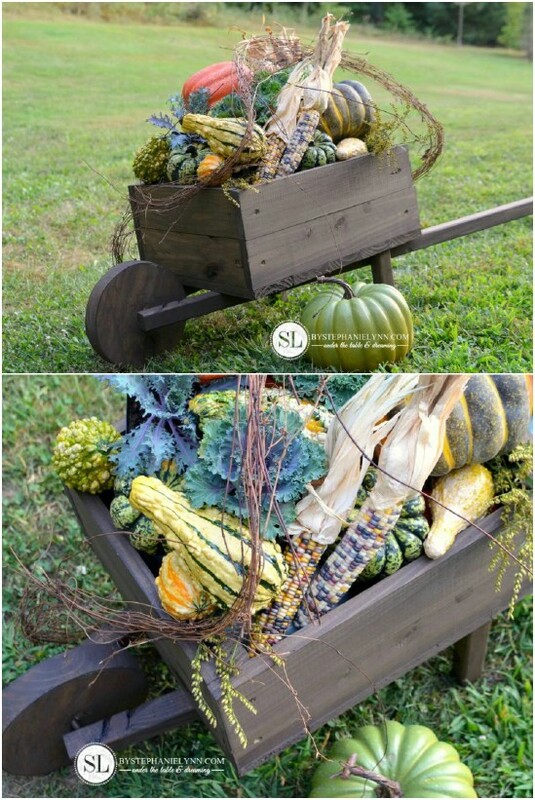 Just park the wheelbarrow in front of your house, or near the mailbox, and fill it with lovely seasonal colors. 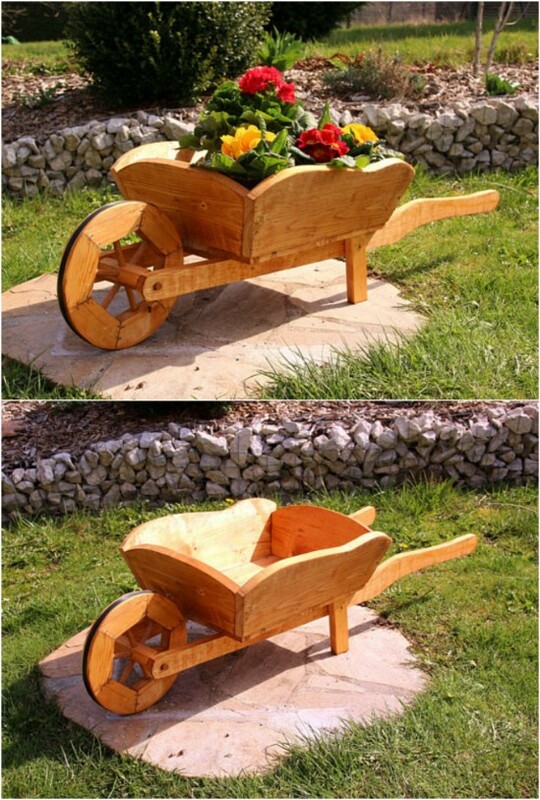 You can even make your own DIY wooden wheelbarrow to use. Have you ever wanted your own firepit? Did you know that you can build a DIY firepit in just about 10 minutes or less? You can when you use an old metal wheelbarrow for the firepit! You just have to fill it with wood and light it – these are great for the backyard for cuddling up on cool evenings or making s’mores with the kids. And, when you are finished with your fire for the evening, you can roll the wheelbarrow and easily dump your ashes where you want them. Take an old metal wheelbarrow and add some decorative touches with mosaics. DIY mosaic projects are so easy and you can make them from broken dishes and other glass that you would otherwise just throw out. Once you have covered the inside of the wheelbarrow with your DIY mosaics, just park it – or tilt it sideways – in the garden to add some beautiful décor to your outdoors. 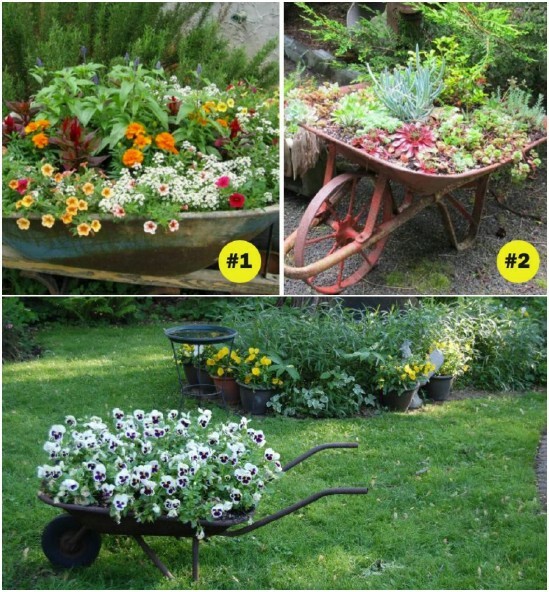 One of the easiest ways to repurpose an old wheelbarrow is to simply turn it into a planter for your lawn or garden. This project takes very little work if any. If you want a rustic look for your planter, you don’t even have to sand or paint your old wheelbarrow. This is perfect for annual flowers or you could use it to plant a nice little succulent garden, too. 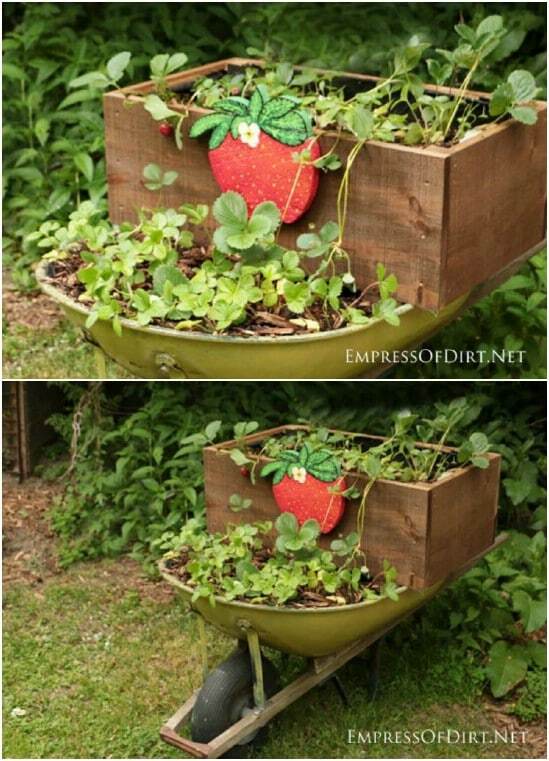 Plant your strawberries in a wheelbarrow and they are super easy to move around the yard whenever you need to do so. This is a great way to grow your own strawberries if you don’t have the ground space available to plant them in a more traditional way. Plus, you can add boxes to the wheelbarrow to give yourself more planting room and the strawberries can vine down the wheelbarrow which makes them easier to pick. 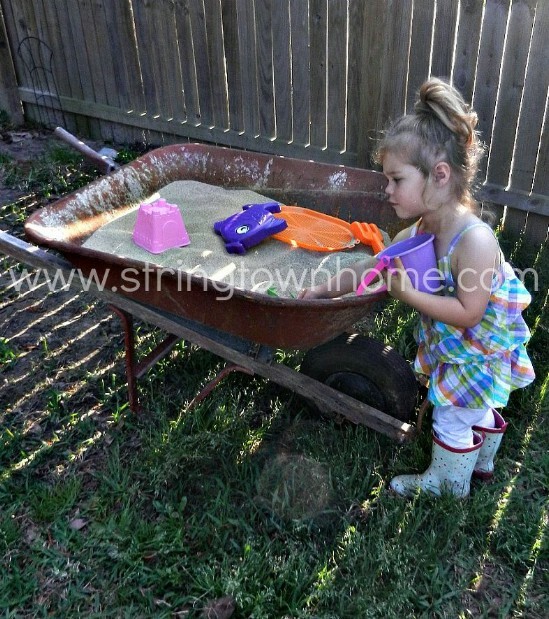 If your kids are screaming for their own sandbox, why not give them one made from repurposing that old wheelbarrow. This is such a simple DIY project and you can have it completed in less than an hour. If you are using a plastic wheelbarrow, you just need to make sure that there are no holes. If you are using a metal one, be sure that there is not metal flaking off that could scratch your little ones before filling it with sand. DIY rain chains are gorgeous and really simple to make. Once you have yours done, you can use an old wheelbarrow at the base of that rain chain to catch the water. This is a beautiful way to decorate – it gives your outdoors such a nice rustic look. And, it helps you to divert water from plants and the base of your home. When the wheelbarrow gets full, just move it to where you want to dump the water. 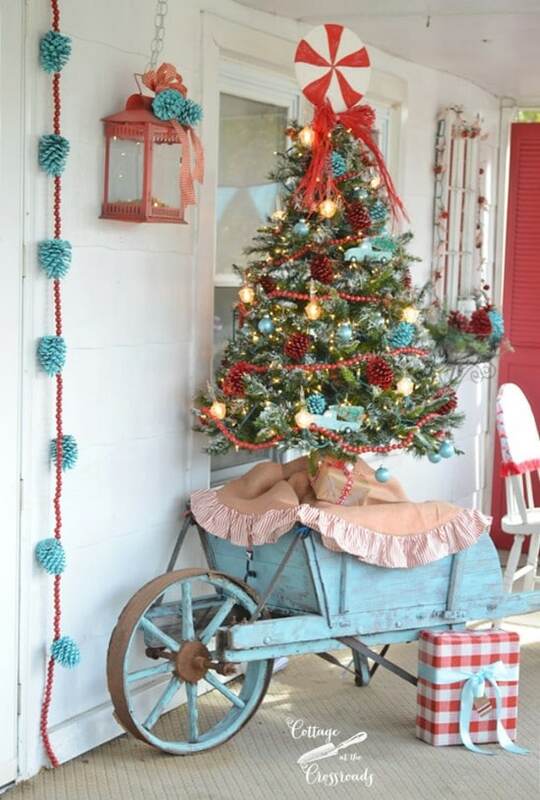 I love the idea of turning an old wheelbarrow into a Christmas tree stand for the front porch. This is a lovely rustic looking setup and it’s really easy to do. You could also use the wheelbarrow during other seasons by just changing out your tree – add a nice topiary for spring and summer or an Easter tree. 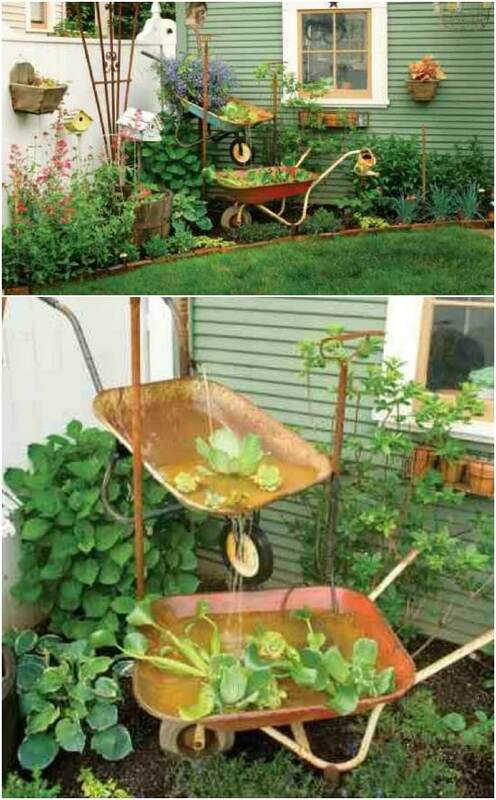 An old wheelbarrow or two could be put together to create a lovely fountain for your garden. You can use your creativity with this one and make the fountain that you want. A couple of them give you a beautiful stacked fountain look that is also really simple to put together. I love this idea for creating a farmhouse look in the garden. If you are planning a wedding – especially an outdoor wedding – an old wheelbarrow is the perfect place to store your wedding favors. 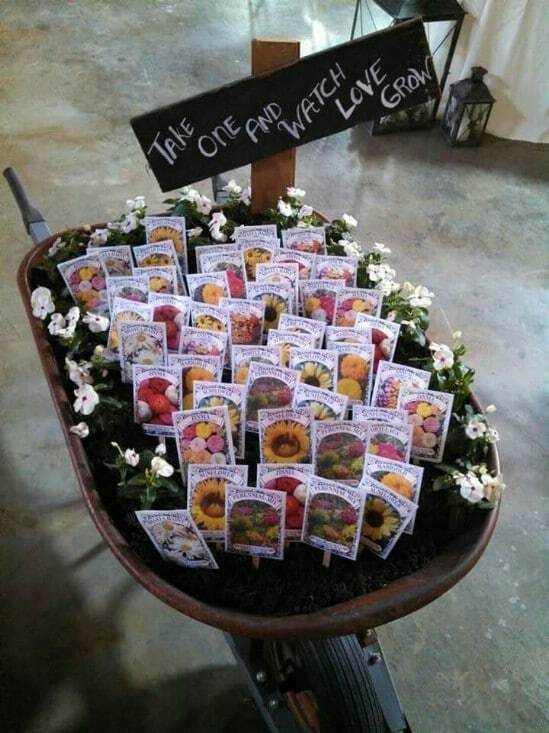 Put some homemade seed packets into the wheelbarrow and have it positioned so that guests can grab their favors on the way out. This is a great rustic wedding reception decoration and it’s easy to move to wherever you need it to be. This is perfect for displaying your DIY wedding favors. 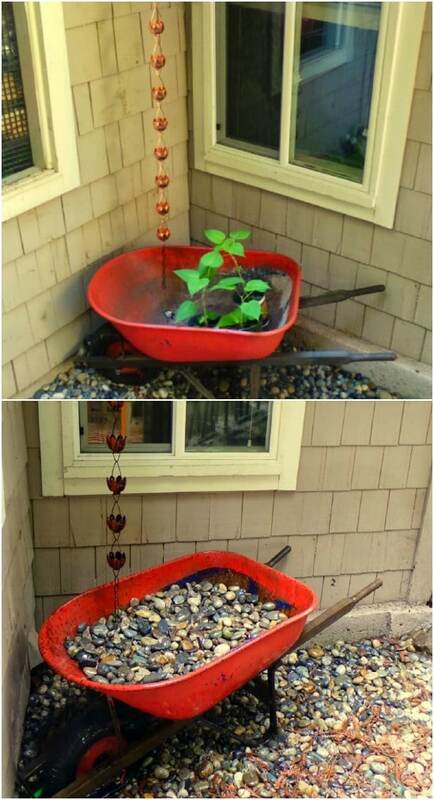 Turn those old wheelbarrows into whimsical yard art! 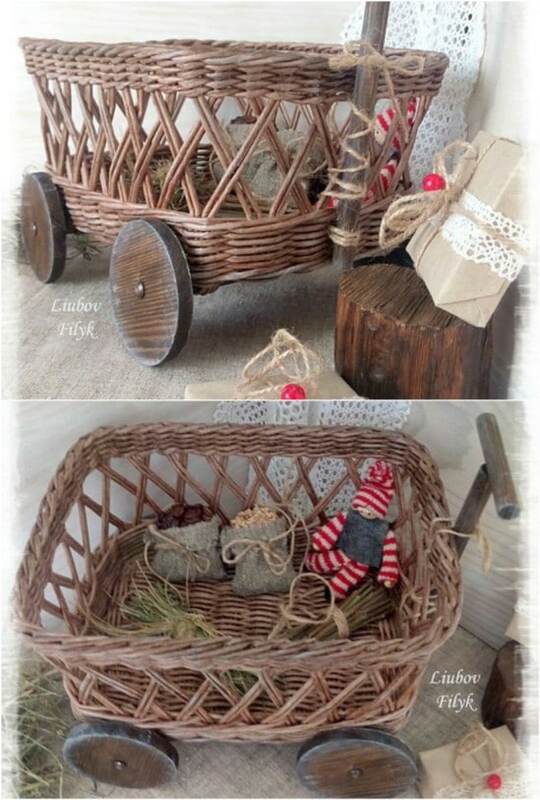 These are so simple and a great way to repurpose a couple of old wheelbarrows. 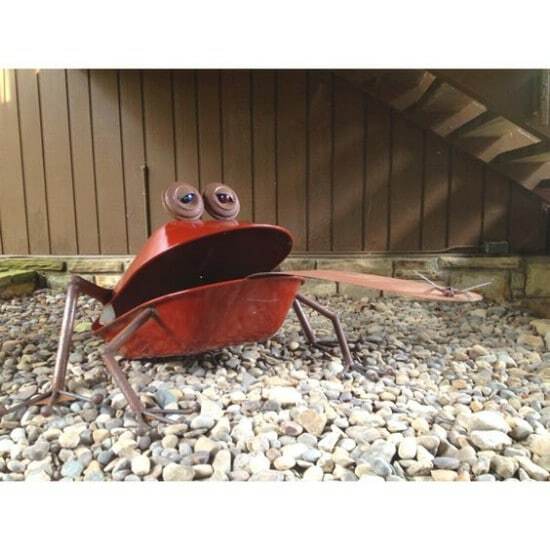 You just take off the bases and then put the wheelbarrow buckets together to make an adorable frog for your garden. 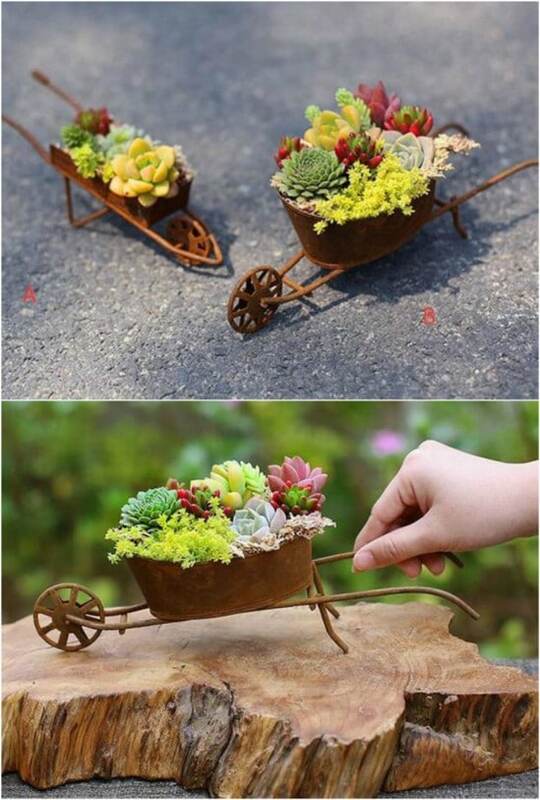 You can think of all sorts of ways to turn that old wheelbarrow into art for your garden.